Male and female gametes fail to egress from their host erythrocytes after induction of gametogenesis. 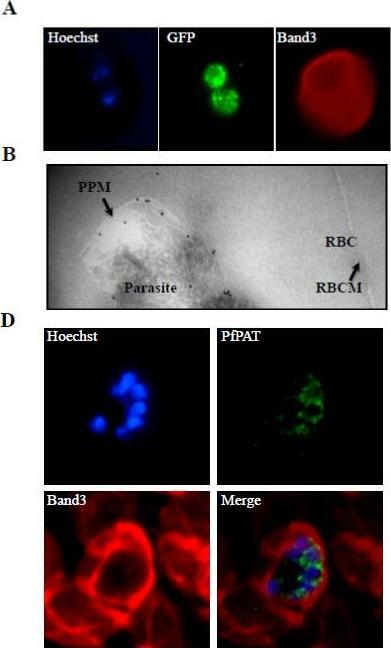 PfPAT localization in P. falciparum-infected erythrocytes. (A) localization of PfPAT-GFP by imunofluorescence analysis using anti-GFP (green). The red blood cell membrane marker Band3 (red) was detected using an anti-Band3 monoclonal antibody. Parasite nucleus was visualized using the Hoescht 33258 dye (blue). PfPAT signal is seen both on the parasite plasma membrane as well as associated with vesicular structures extending from the nuclear membrane in all blood stages – probably due to over expression. (B) Transmission electron micrograph of ultrathin cryosections of the intraerythrocytic early trophozoite stage of P. falciparum PfPAT-GFP transgenic parasites using anti-GFP antibody (18-nm gold particles; indicated with arrowheads). PPM: parasite plasma membrane. RBC: red blood cell. RBCM: red blood cell membrane. Most PfPAT signal (~68% of gold particles) is found to be associated with the parasite plasma membrane. (D) Localization of PfPAT in P. falciparum 3D7 parasites at the schizont stage using anti-PfPAT antibodies (green). The red blood cell membrane marker Band3 (red) was detected using an anti-Band3 monoclonal antibody. Parasite nucleus was visualized using the Hoescht 33258 dye (blue). Localization of the protein to the plasma membrane of the parasite is seen at all stages of the parasite intraerythrocytic life cycle. This localization is particularly noticeable in parasites at the schizont stage with fluorescence signal surrounding each individual merozoite.Augagneur Y, Jaubert L, Schiovani M, Pachikara N, Garg A, Usmani-Brown S, Wesolowski D, Zeller S, Ghosal A, Cornillot E, Said HM, Kumar P, Altman S, Ben Mamoun C. Identification and Functional Analysis of the Primary Pantothenate Transporter, PfPAT, of the Human Malaria Parasite Plasmodium falciparum. J Biol Chem. 2013 288(28):20558-67.